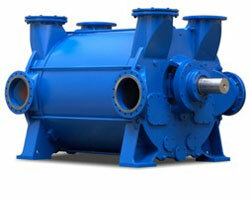 Vacuum pumps with suction capacity of 34-39.000 m³/h, with vacuum up to 33 mbar abs. Reliable operation for long time, high quality design and best processing of machine. Minimal running costs due to extremly low maintenance and optimized energy consumption. From the inventor of the liquid ring pump. Single- or two stage, also in compact construction or in base execution. 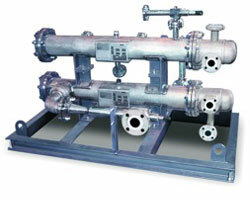 Compressors with capacity of 100-4.300 m³/h, with pressures up to 15 bar abs. Highly rugged and reliable construction to handle highly toxic, explosive and corrosive gases, as flare-gas, chlorine and Vinyl Chlorine Monomer (VCM) recovery. Minmal maintenance and optimized energy consumption for low operating costs. Gardner Denver Nash offers a wide range of standard pre-engineered packages for general industry. A high level expertise - in design and manufacture of systems – fulfills the needs of specific processes.These systems are reliable, ready for operation and easy to integrate into process automation, help to minimize installation and operating costs, and most of all are designed to meet the requirements of the most demanding applications. Ejectors are ideally suited to handle applications with large volumes, high vacuum levels, low molecular weight gases and low absolute pressures. They are available in different sizes (2,5 cm to 2 m) and may be combined in various stages to meet the specific ejector application needs. Capacities range from 35 to 34,000 m³/hr and vacuum as low as 0.001 mm Hg abs. Ejectors can be manufactured in a variety of materials and require no moving parts. 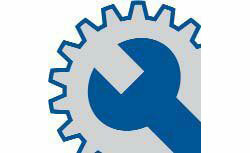 Complete maintenance and repair sevice, either in Service Centers or on site. Fiberscope inspections, pump swap out program, start-up assistance and trouble-shooting, capacity testing and vibration analysis. 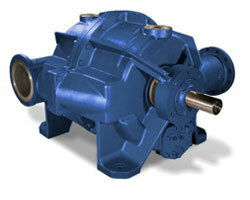 All repairs are guaranteed to bring your pump to better than or equal to 95% capacity of a new factory pump. All new, remanufactured an repaired parts meet current specifications. 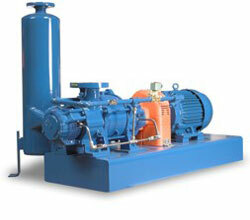 As improvements are made to particular parts for better pump performance, the pump will be upgraded automatically. Images on this page are courtesy of Gardner Denver Nash.